Phil Browne and Barry Rock met with new teachers. Phil told them about Concord High School Advanced Placement calculus students using Forest Watch data to learn statistics. Barry urged the new recruits to core trees with their students. SUMMER WORKSHOPS connected Forest Watch with more than a dozen new teachers from schools in New Hampshire, Maine and Massachusetts. On campus in Durham, teachers raced through an intensive day of Forest Watch training. They set up a plot on the Main Street lawn by the grave of UNH founder Ben Thompson, measured diameter at breast height, checked canopy closure, inventoried ground cover and collected samples. In the afternoon, the carrot microtome posed interesting challenges in manual dexterity as teachers made cross sections of pine needles. They also had a quick peek at the VIRIS, remote sensing and wood cores. 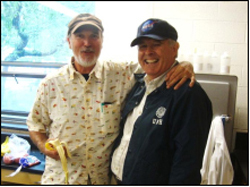 Phil Browne and other veteran Forest Watch teachers have volunteered to serve as mentors to this new crop of teachers. Eight more teachers from North Country schools learned about Forest Watch in a two-day workshop presented by the North Country Education Alliance, a project developed by Dr. Eleanor Abrams and Dr. Mike Middleton in the UNH Department of Education. This group focused on one Forest Watch activity, measuring dbh, and developing field measures into an analysis of forest health. Teachers were amazed at how much information one measurement can provide about site conditions and possible land use management needs for the future. The North Country group included Maple Watch pioneers Valerie Ford, Jon Marshall and Tracy Vokey from Josiah Bartlett School, Bartlett, NH, as well as teachers from Colebrook, Groveton, Berlin and Ossipee. Eleanor and Mike offered to help mentor these teachers. Why Are Our Pine Trees So Tall? AFTER 20 YEARS of educational service to students and teachers, many Forest Watch trees are too tall and too crowded for sampling and measurement. What happened? The ideal pines for Forest Watch studies have low branches and enough roomy space so those low branches will stay green for years and years. 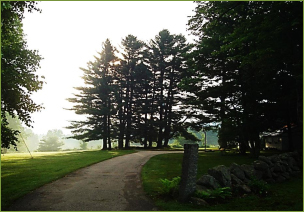 White pines, Pinus strobus,are conifers, trees which evolved early in plant history. Deciduous trees evolved later with a multitude of tricks to deal with a growing forest and the shade and crowding bigger trees may cause. But conifers did not. When branches are shaded, a pine simply sheds those needles. Entire branches die and fall off. The pine grows taller and taller and produces needles only on upper branches that reach the sun. It is time for many veteran Forest Watch schools to select new trees. That may be a sad assignment for many Forest Watch teachers. They and their students are closely connected with Tree 373. But they can continue assessing dbh and general health for those old friends. But needles will come from new trees. Forest Watch has developed a new protocol for selecting a young tree in an open area. The tree needs plenty of foliage no higher than one or two pruning pole segments—so teachers and students can reach needles. The ideal tree also needs to be in a site where it will be managed longterm for continued educational value. Forest Watch is developing another protocol to help teachers and their students build and present management plans for their trees to school principals, superintendents, boards and grounds keepers. Forest Watch trees are valuable assets to the whole school community. They need protection from damage. These pines need a voice when parking lots or soccer fields are expanded. And, if they grow in a grove at the edge of school lands, they need their forest to be thinned regularly to maintain healthy sunny growing conditions. Email Martha Carlson, Martha.carlson@unh.edu if you’d like help. 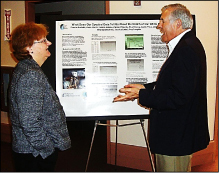 Dr. Toni Galvin, director of NH Space Grant Consortium, which funds Forest Watch, and Barry Rock discuss the Red Edge Inflection Point which Gilmanton School students explained perfectly in one of four posters they produced for our May Student Convention. HOW DO WE MAKE science interesting to students? Is a Forest Watch exercise in collecting needles and measuring them valuable to the student? The answer is “Yes” for veteran Forest Watch teachers. They know how to make Forest Watch a doorway to science and learning for students. Forest Watch students solve a problem or build a project of their own choice. Those projects have direct value in the students’ community—students are helping to manage a forest, to improve timber growth, build wildlife habitat, or make tasty maple syrup. Students meet real scientists and share collegial moments about their common research. Students present their findings to scientists, the school community and other audiences. Forest Watch is more than a field trip, collecting samples and measuring them. The real value of data collection comes when students have time to analyze results, build charts and graphs, think about what those results mean, look for correlations, discuss results with classmates and scientists. And the big thrill often comes when students present their findings and stand the test of critical evaluation from an audience. Those new skills lead to new discoveries! Plan a field trip to the UNH Student Convention next May or invite UNH Forest Watchers to visit your classroom to hear a presentation. Let us know if you have a project or application of Forest Watch that gets students really excited. Let’s share those secrets with others. ON SEPTEMBER 30, Forest Watch will host a morning brainstorm about our next 20 years. 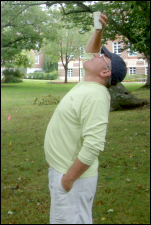 How could Forest Watch continue and improve as a university outreach science program to schools throughout New England. Can we add new scientific research such as climate change? Can Forest Watch help more schools bring science, technology, engineering and math into the curriculum? Could veteran Forest Watch teachers train and mentor a new generation of science teachers? Could Forest Watch teachers train a new generation of scientists to do effective outreach? Please email if you would like to join this committee. UNH Discovery Dome Program Needs Forest Watch Schools! THE LIVING FOREST is a virtual immersive experience in the portable Discovery Dome in which students can interact with a typical New England forest as it moves through three growth stages. Students explore the forest through time and use the tools provided to experience and observe change. Student may investigate different trees species by making observations of bark color and texture, leaf shape, canopy closure and more. 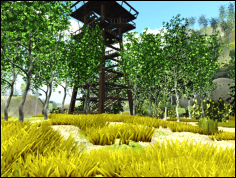 The forest is in development and we are looking for demonstration sites. Please contact Calvin Diessner at Calgdiessner@gmail.com if you are interested in testing with your students. This will aid in our development of future immersive learning tools.